The United States Congress designated the Katmai Wilderness (map) in 1980 and it now has a total of 3,384,358 acres. All of this wilderness is located in Alaska and is managed by the National Park Service. The Katmai Wilderness is bordered by the Becharof Wilderness to the south. The Katmai Wilderness, located within Katmai National Park and Preserve, is characterized by active volcanoes, pristine lakes and rivers, glaciated peaks, and rugged coastline. The area contains the famed Valley of Ten Thousand Smokes, a spectacular forty square mile, 100 to 700 foot deep ash flow deposited by Novarupta Volcano in June of 1912 during a major cataclysmic eruption. 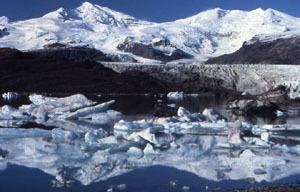 In addition to Novarupta, the Katmai Wilderness contains many other active volcanoes, including Katmai, Trident, Mageik, Martin, and Fourpeaked. The area is home to an abundance of wildlife. The most widely known is the brown bear, which resides throughout the coastal and lake regions of the Wilderness. Other land mammals that call Katmai home include moose, caribou, red fox, wolf, lynx, wolverine, river otter, mink, marten, weasel, porcupine, snowshoe hare, red squirrel, and beaver. Along the coast and offshore islands are sea lions, sea otters, and hair seals. The lake edges and marshes serve as nesting sites for tundra swans, ducks, loons, grebes, and arctic terns. Sea birds abound along the coast, grouse and ptarmigan inhabit the uplands, and migratory songbirds birds nest within the spruce and birch forests and alder thickets. Seacoast rock pinnacles and treetops along lakeshores provide nesting sites for bald eagles, hawks, falcons, and owls. The Katmai Wilderness also contains many large pristine lakes and rivers. Major lakes include Brooks, Coville, Grosvenor, and the Iliuk Arm of Naknek Lake. The major rivers within the area include the Savonoski, Katmai, Kamishak, Swikshak, and Big Rivers. These lakes and rivers provide excellent habitat for salmon, trout, and other species of fish. In turn, the fish provide a primary food source for brown bears and other animals. The Katmai Wilderness also has a rich cultural and historic significance ranging from the remnants of homes and villages left by native Alaskans over the last several thousand years to early 20th century Russian, European, and American trappers, miners, and clammers. Planning to Visit the Katmai Wilderness? How to follow the seven standard Leave No Trace principles differs in different parts of the country (desert vs. Rocky Mountains). Click on any of the principles listed below to learn more about how they apply in the Katmai Wilderness.